If your holidays are coming and you do not know how you can enjoy them, our estate agents in Costa Calida recommend you buy one of their apartments for sale Los Alcazares. These are great properties that have been designed with high quality materials to suit all your needs. Casas Espania Real Estate offers you a wide list of properties in Los Alcazares. Our apartments are ideal to enjoy your months of rest. Los Alcazares is a maritime city on the Costa Calida (Murcia) that has a component that makes it special: its climate. Buying one of our apartments for sale, you can enjoy your vacation in a city where barely bad weather. Their winters are very pleasant, with little rain. Your summers are very hot. Its fantastic annual weather has turned Los Alcazares into a city in great demand by tourists from different parts of Europe. Are you a client with international residence? Our professionals know what is the best way to fulfill your dream of living in Spain. We are specialists in the Spanish real estate sector for foreigners. We always offer the best close and personalized treatment. Another of the benefits that you will acquire if you decide to buy one of our fabulous apartments for sale Los Alcazares will be to live a few steps from the beach. Los Alcazares is a city popularly known for its fantastic beaches. The combination of a warm city and amazing beaches make Los Alcazares a perfect place to live. If you love the coast, you will not have to take the car to enjoy it. 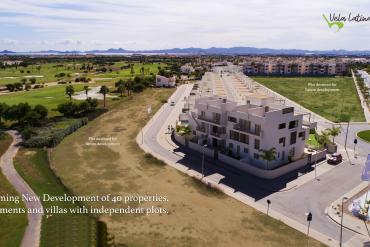 Our estate agents in Los Alcazares offer you the opportunity to access a home that is built a few meters from the sea. Its beaches, as we were saying, are wonderful. They are composed of fine sand and crystal clear water. Can you imagine lying on the sand, sunbathing quietly and then bathe in clear waters? Do not dream anymore and allow Casas Espania to help you make it come true. There are only a few months left for summer. If you do not know how you can enjoy your rest time, Casas Espania gives you a solution: apartments for sale Los Alcazares. If you need to know more information about our properties for sale in Costa Calida, do not hesitate to get in touch with us. Our office in Los Alcazares is located at 102 Avenida de la Libertad, Los Alcázares, Murcia, Spain. Our telephone number is 0034 966 107 981 and our email info@casasespania.com Our professionals will attend you superbly and will help guide you along the path of your well-being. We will wait for you!